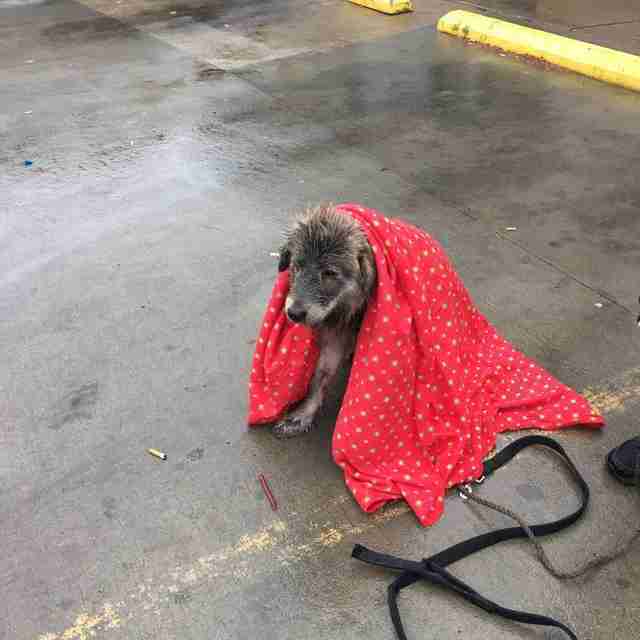 Someone finally stopped to give him a blanket — and find him a home. 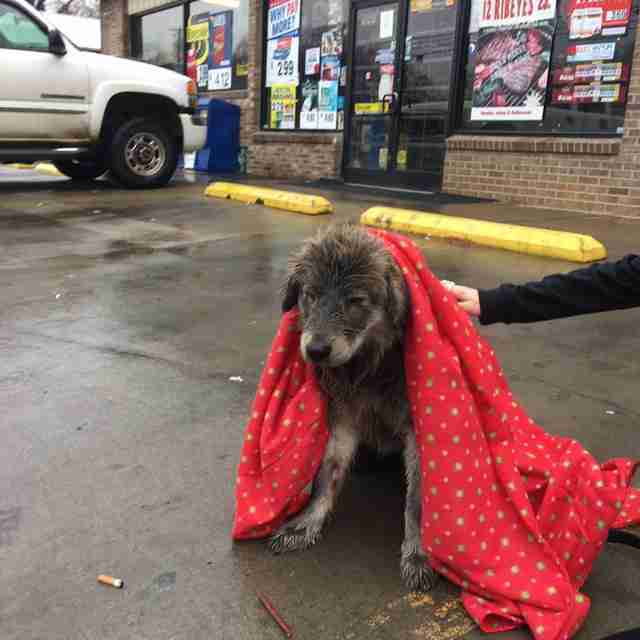 If ever there was a portrait of despair, it was a dog standing in the cold driving rain in front of a North Carolina convenience store. She seemed to have given up on everything. Even staying dry. But others refused to give up on her. 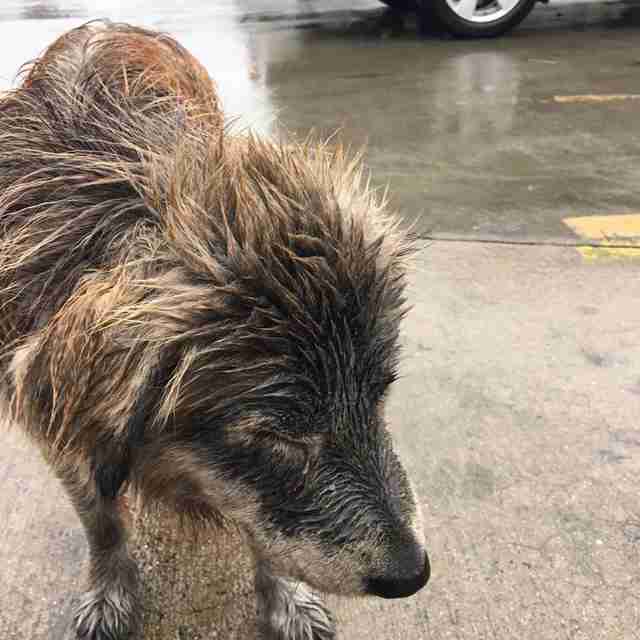 In fact, Valinda Cortez was still in her pajamas and flip-flops that Sunday morning when she stopped at the store and spotted the drenched dog. "When I got out of the car, my heart sank," Cortez tells The Dodo. 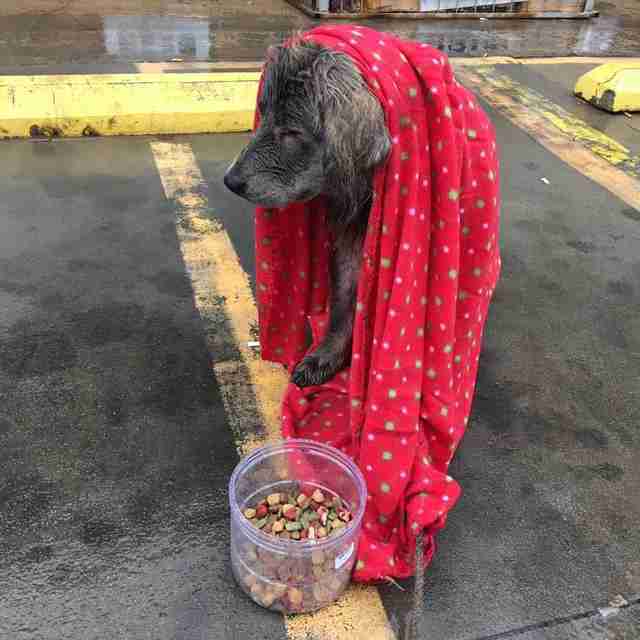 "This poor baby had been out in the rain and cold for a long time. She was freezing." "It was apparent to me that this baby had been dumped," she adds. Although terrified, the dog didn't flinch when Cortez draped a blanket over her. Nor did she move when the woman offered her hand. So Cortez decided not to move either. She stayed in that parking lot with the shivering dog for more than an hour, gradually earning her trust. "Her hair was wet and matted," Cortez says. "Her front leg was cut. Her eyes were obviously infected. My heart was breaking. "I never think these things through so I wasn't sure what I was going to do with her after I had her." She eventually called her friend, Sue Massi, a woman who also volunteers to save local strays. Massi got to the scene in 20 minutes, where they met an animal control officer from Buncombe County. 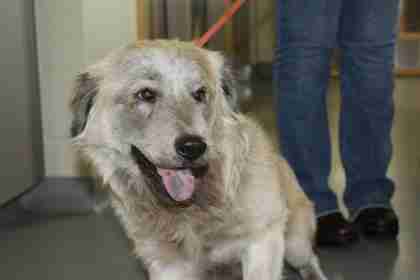 Together, they gently coaxed the dog into a car and took her to the shelter. "Humans had let her down but hopefully the food, warm blanket and love I gave her will restore her faith in humans," Cortez says. Indeed, in just a few days, it seems the dog, who was named Cassie, has already gotten her smile back. And, when cleaned up, she looks like a completely different dog. "That picture of her is perfect. Such a difference," Cortez says. "My heart is happy." Soon, Cassie will be looking for a real home. Think that could be you? View Cassie's shelter profile here. You can fill out an adoption application here. "There are always options," Cortez says. "What if I ignored this cold, wet, hungry dog and kept driving? She could have froze to death, been hit by a car or numerous other things. It's not that hard to find a shelter that will take your animal."